The following is a preliminary translation of Magophon’s French commentary to the Mutus Liber. We are counting on the assistance of skilled proof-readers to produce a final improved version where errors of spelling as well as such passages where the idiom remains unclear have been corrected. We then hope that this will present a valuable addition to the presently available selection of material on alchemy in the English language. Magophon was the pseudonym of Pierre Dujois, one of the greatest French erudites around the beginning of the XXth century. He belonged to the circle around Fulcanelli. The Mutus Liber was first published at La Rochelle in 1677. The author's name was given as Altus, a pseudonym. The Mutus Liber also occurs in Manget’s Bibliotheca Chemica Curiosa of 1707. More information may be found in A Prelude to Chemistry by John Read, London 1936, page 155 et seq. This title, good as it may seem, has not the least pretension. It is all technical, the only suitable and genuine on the subject, because it traces, in its conciseness the plan of our study. A hypotypose (from υπο, under, and Τυποσ, print, emblem) is an explanation placed under abstract figures. Well, the Mutus Liber is then a collection of enigmatic images. Around the Mutus Liber an absurd legend has formed itself. One school - which has nothing hermetic except the name - has given this work a reputation of impenetrable obscurity, and as such, worships it as a sacrament, without understanding it. This is an error; even as translating Mutus Liber by the Mute book, without words, is a philosophical misnomer. All the signs adopted by human industry to manifest thought are words. The Latins - this word suitably intended - call drawing, painting, sculpture and architecture, by means of which the Hierogrammates1 reserved for the elect the mysteries of science, mutæ artes, which means the symbolic arts. What is then a symbol? Συμβολον is a convention; Συμβολον, a sign of recognition. Hence a symbol is that which we today call a “code”, a tacit system of writing adopted for diplomatic and even commercial correspondence, for telegraphic and semaphoric communications etc… For an illiterate person, all books are mutus. A volume in Hebrew, Sanskrit, Chinese is a Mutus Liber, a mute book, for the majority, even though they be instructed in their proper language. One has then, to get used to this very simple idea, that the Mutus Liber is a book like all the others and can be plainly read, once one has the grille. Moreover, the alchemical works, in verse, prose, Latin, French or any other language are themselves nothing but cryptograms. Although written with the ordinary letters of the common alphabet and vocabulary, they remain no less indecipherable for those who ignore the key. To tell the truth, among the two steganographic procedures, the one of the Mutus Liber is still the more transparent, for the objective image is certainly more speaking than literary tropes and rhetorical figures, especially in a matter as experimental as chemistry. While attaching these few pages of commentary to the allegorical plates of the Mutus Liber, we are proposing, without leaving the philosophers mantle, to facilitate the lecture, by a sincere interpretation, to the true inquisitors of science, honest, patient and laborious like the diligent bees, and not to the curious, idle and frivolous, who pass their lives uselessly fluttering from book to book without ever pausing at one to extract the mellific substance. But what! Grammar, geography, history, mathematics, physics, chemistry and the rest do not become accessible but after long and cumbersome efforts, and who would enter into the ”King's Palace” without observing the conventions and submit to the laws of etiquette! A hasty and superficial lecture would not replace an austere and serious study. Even the profane sciences are not to be penetrated and assimilated, but after sustained and prolonged work. One can object that the University counts some illustrious grammarians, geographers, historians, mathematicians, physicians and chemists, but that one never notices the least alchemist there. And if the Bachelor of Alchemy is unknown, it is because alchemy is a chimera. 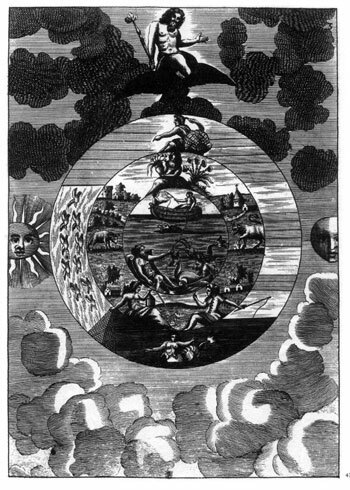 This argument ad hominem is not without an answer: a thing hidden is not at all to be taken for non-existent, and alchemy is an occult science; or better: it is occult science in its entirety, the universal arcanum, the seal of the absolute, the magical resort of religion, and that is why it has been called the Sacerdotal or Sacred Art. There is in all faiths impressed upon the vulgar by means of an appropriate mythology: Bible, Vedas, Avesta, Kings, etc., a positive substratum, which is the foundation of the sanctuaries of all the cults that are propagated on our globe. The mystery, recognized in the catechism as the apanage of the Pontiffs - who are not the public Dignitaries - is alchemy on all its planes: physical and metaphysical. The exclusive possession of the sacrarium, makes up the force of the Churches; they then also watch over the “Masonic secret” with a worried and jealous care, aided by a suspicious police and censorship. 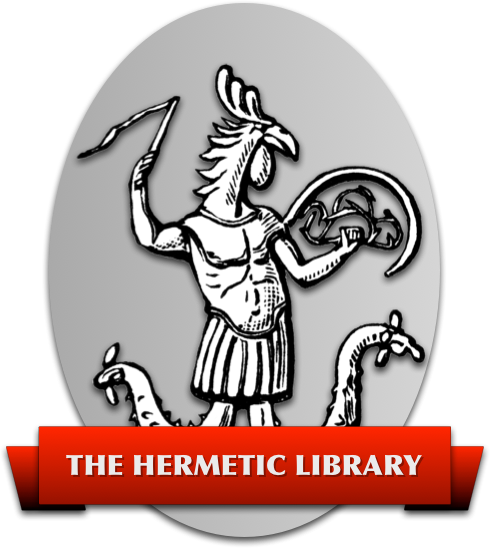 We are not advancing anything hazardous, and while these allegations may seem unfounded, because impossible, note that since the invention of printing, the hermetic books have always been published freely with license from the civil and religious authorities. And nothing would really be opposed to the spreading of these libels written in known languages, but for the contents; over such a sign which the greatest school chemists - from Lavoisier to Berthelot - have broken their heads without result. And is not this the place to recall the disdainful address of Arthépius and the haughty warnings of the Adepts who unambiguously declare, write only for those who know and allure the others! Thus one makes the “Christ” speak in the Gospels, and the disciples model themselves after the “Master”. But, while being a hidden science, alchemy is nonetheless a real and exact science, conforming to reason and moreover rationalistic. At all times there have been “gold-makers”; the “gentlemen glassblowers” who enjoyed such a high consideration, were hermetists. And even in our own days, transmutation still works miracles. After the sensational debates a little while ago2, it was told - and among what stupor - that the Monetary Administration should have seized, without any other form of process - and not without reason! - the production of a contemporary alchemist: - “You are not supposed to know how to make gold” he was told with a threatening air, and was sent back with free but empty hands. Is it then prohibited to be a sage, or is alchemy perhaps a state secret? This should not lead to the naive conclusion that the ministers who succeed each other are acquainted with the Kabbala. The kings rule but do not govern, according to a famous aphorism. And for the moment it seems as if there still is, behind the screen, some gray eminence who pulls the strings! The famous “Galetas of the Temple” is perhaps not as abolished as one supposes him to be, and he would there have a surprising book to write with watermarks on bank notes and with seals on coins. But in that case, one says, why has gold become so rare as to nearly paralyze social life? The bars have not evaporated, but have been displaced, and one must keep in mind that they will return to their point of departure by an inverse economic movement. Only, too much slowness in this return can have incalculable consequences. The politics of nations is regulated by a secret metallic pact, that cannot be violated without entailing the most serious international complications. Paper money is therefore to be issued with much effort, but no longer are gold coins to be minted. And yet, it is not the gold that is lacking: it is openly displayed, and with what splendor, on innumerable shoulders, around wrists, on fingers and even legs, whose elegance and beauty sometimes leave something to be desired. Nothing would therefore be easier for the state than to exchange its paper against the precious matter and to put the “coins” into circulation. This is paradoxical, yet true. There is then behind this momentary eclipse in the value of gold a profound reason based on wisdom. “Gold is whatever is gold worth” says an adage. If coining was allowed to the nations who have exhausted their normal reserves, then overabundance would lead to depreciation. The paper standard would no longer offer any guarantee and would be equivalent to false money. The financial equilibrium would be broken ; this would be the death of business and world ruin. This is why even the “natural” production of gold is limited, even as concessions for new mines are refused and until its extraction at poor yield, river beaches and others. In the meantime, the hour is near when science will totally reclaim all its rights, and when the occult will again become manifest as it was in former times. The sage Girtaner has announced it, while basing his opinion on ignored but certain laws: “In the XXth century the Chrysopée shall be in the public domain.” This considerable event is evidently subordinate to a social status quite different from the one that rules today; but we are strongly going there, the world turns fast; and who can foretell the charter of tomorrow! However, if alchemy is limited solely to the transmutation of metals, it would doubtlessly be an inappropriate science from the industrial point of view, but equally mediocre from the philosophical point of view. In reality it is not like that. Alchemy is the key to all knowledge, and its complete divulgence is called to overthrow from top to bottom, all human institutions that are based on falsehood, in order to re-establish them in truth. These preliminary considerations seemed us to be opportune, before charitably taking the reader by the hand, to lead him through the inextricable meanders of the labyrinth. As our intention is to be useful to the seeker, but since we cannot, in a few pages, write a technical treatise, we must before entering into the material, orient the disciple towards the work which best seems to correspond to the figures of the Mutus Liber. The major part of the manipulations indicated in this collection of symbols, find themselves well enough described by the most notorious philosophers, in “An open Entrance to the closed Palace of the King“, by Eirenæus Philalethes. It is not that nothing more could be added thereto. Far from it, on the contrary. The practice of Philalethes, presented under an amiable and persuasive exterior, counts among the most subtle and perfidious fictions of hermetic literature. Yet it does contain the truth, but similar to poison, sometimes conceals its own antidote if one only knows how to isolate it from its pernicious alkaloids. As occasion arises we shall signal the traps, in so far as they present themselves to us along our way. The Mutus Liber is composed of fifteen emblematic plates, some truthful, others misrepresented, and disposed according to one of those beautiful disorders, that, following the precept of Boileau, is an effect of the art. The first plate that serves as frontispiece is truly capital. On its comprehension depends the whole success of the Work. One sees there, inside a border formed by two interlacing rosaries, a man asleep on a rock whereon grow some languishing kermes-oaks. A limpid water with metallic reflections flows out from it. 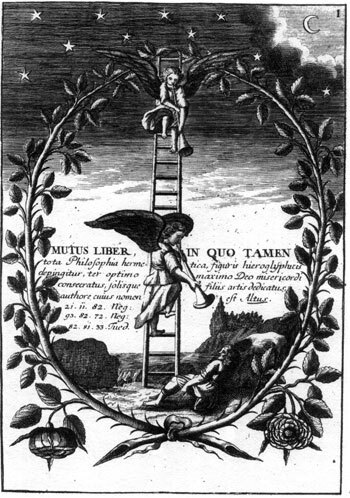 Next to the sleeper, on a ladder - the Stairway of the Sages - two angels are blowing their trumpets to awaken him. Above, a propitious and reposeful night sky: the stars are shining and the moon outlines its horn of plenty. This initial page should bring with it a criticism not directed towards the learned author, but towards the profane artist, who in reproducing the figures has committed, without suspecting, a grave mistake. And it is already a great achievement merely to notice this, without it being necessary to insist more upon it. The hermetic expositions will warn the disciple, who does not judge it useless to inform himself about it. The sleeping man is the subject of the Work. What is this subject? Some say it is a body; others affirm that it is a water. They are both right because a water called “the silver beauty” springs from this body that the Sages call the Fountain of the Lovers of Science. It is the mysterious selago of the Druids, the matter which gives the salt (from sel for salt and agere to produce). The secret of the magistry is to also disengage its sulphur, and to utilize its mercury, for everything is in everything. Certain artists pretend to turn elsewhere for this effect, and we do not deny that the hydrargyre of cinnabar may be of some help in the work, if one properly knows how to prepare it for oneself; but one should only use it knowingly and at the right time. For us, he who succeeds to open the rock with the staff of Moses, and that is not a small secret, has found the first operative key. On this steep rock then, will flower the two roses that hang from the branches of the sweetbriar, one white and the other red. One will ask us, and not without reason, what magic word is capable of extracting from the arms of Morpheus our Epimenides3, who really seems to be deaf to the clamor of the trumpets. This word comes from God, carried by the angels, the messengers of fire. It is a divine breath that stirs in an invisible, but certain, manner, and this is no exaggeration. Without the concourse of the heavens, the work of man is useless. One neither grafts trees, nor does one sow the grain during all seasons. Everything has its time. 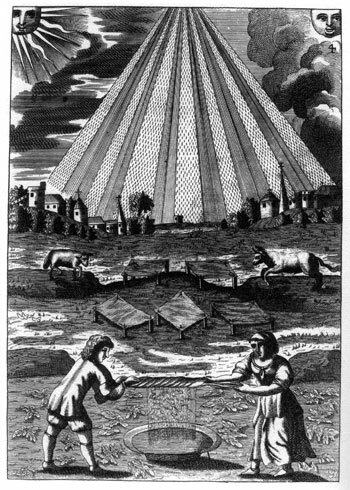 The philosophical Work is called the Celestial Agriculture, and not without cause; one of the greatest authors has signed his writings with the name Agricola, and two other excellent adepts are known under the names of Grand Paysan and Petit Paysan. Thus, the disciple will have to meditate a long time on this first plate and compare it with the apologues in vulgar language. May he then be fortunate enough himself to hear the heavenly voice; but let him know ahead of time that he will lend his ear in vain, if he has not nourished himself on the Holy Scriptures. The second plate is not in the order of operations. It represents the philosophical egg, and yet, up to here there is nothing that could have acquainted us with the elements that must compose it. In order to give us an idea of this, we must deliberately go over a certain number of symbols. All eggs comprise a germ - Purkinje’s vesicle - which is our salt; the yellow, which is our sulfur, and the albumen, which is our mercury. These are enclosed within a retort, which corresponds to the shell. The three products are here personified by Apollo, Diana and Neptune, the God of pontic waters. Tradition requires that this retort be enclosed within a second one, and this one again within a third one made of wood from an old oak. Flamel expressly says: “Note that oak tree”, and Vico, the chaplain of the lords of Grosparmy and Valois recommends it with no less interest. This insistence is significant, and we must recall that in the first plate, on the rock of the Sages grows the Kermes oak, which is the Hermes of the Adepts, because, in the Hebrew language, K and H are but one and the same letter, taken alternatively one for the other. But here one must be on guard, the mineral kermes leads to the trap set by Philalethes, Artephius, Basil Valentine and many others, and one should not loose view of the fact that the philosophers delight in certain verbal collusions. Ermh is the artificial mercury that amalgamates the compost. The size of the egg is of importance. In nature, the egg varies from that of a wren to that of an ostrich; but, says Wisdom, in medio virtus. Something must also be said about the philosophic glass. The authors speak only little about it, and then with reserve. But we know, by experience, that the best is that from Venice. It must be of a thorough thickness, limpid, without bubbles. In former times one still used the great glass of Lorraine made by the gentlemen glassblowers; but a good practitioner must learn to make his retort by himself. The lower figure on this second plate represents an athanor between a man and a woman on their knees, as if they were praying, which has led certain feeble spirits to believe that prayer intervenes in the work as a ponderable element. Here it is a nonoperating factor. The main thing is to employ expedient materials; but the élan of the creature towards the creator can have a favorable influence on the directives, for the light comes from God. One must nevertheless liberate oneself from these not very effective suggestions. The artists prayer is yet more his work, often hard, dangerous and incompatible with too white hands. Count then above all on the improbus labor. The third plate is no longer in its place. It leads us into the empire of Neptune. One sees, frolicking in his waves, the dolphin dear to Apollo and on a boat some fishermen putting out their gear. In another ship a man lies stretched out in a nonchalant position. In the second, a landscape with on one side a ram, on the other a bull, which we shall find back further on and shall study at a more opportune moment. Below on the left a woman holds a basket which is the symbol of the grated lantern of the philosophers; on the right a man throws his (fish) line into the ocean which is found within the third circle (the one that encloses the two others). The third circle is animated by a flock of birds to the left; a siren below and Amphitrite up on top. In the margin the sun and the moon, and hovering over this nautical scene, Jupiter carried by his eagle. This whole figure aims at showing that the operator must deploy all his faculties and put to work all the resources of the art in order to capture the mystical fish, about which d’Espagnet speaks. The author should first have instructed us how to weave the thread necessary for this miraculous fishing. Let us amend his omission: The weir must be braided in a very fine maze from asbestos, which has the property of being incombustible and of staying unaltered. The device being well disposed in the deep waters, one must furnish oneself with a lantern whose luster will attract the prey into the nets. One may also, following other symbols, employ a line; but the arcanum is in the preparation of the pocket, and the word is circumstantial, for it concerns nothing less than to catch the golden fish. Certain authors, and not the lesser ones, have pretended that the greatest operative artifice consists in capturing a solar ray, and to imprison it in a flask closed with the seal of Hermes. This gross image has caused rejection of the operation as something ridiculous and impossible. And yet, it is literally true, to the degree that the image coincides with reality. It is moreover unbelievable that one should not have thought of it. This miracle is accomplished in a way by the photographer when he makes use of a sensitive plate which one prepares in different ways. In the Typus Mundi, edited in the XVIIth century by the Fr. of the Society of Jesus, one sees an apparatus, described also by Tiphaigne de Laroche, by means of which one can steal the Heavenly fire and fix it. One can no longer say that the procedure is scientific, and we candidly declare that we are here revealing, if not a great mystery, at least its application to practical philosophy. The eagles that are flying to the left, inside the great circle are designating the sublimations of the mercury. One needs from three to seven for the Moon, and from seven to ten for the Sun. They are indicated by the flying of the birds and are indispensable, for they prepare the nuptial robe of Apollo and Diana, without which their mystical union would be impossible. That is why Jupiter, the God who governs the eagle, presides over these operations. The fourth plate shows how the collection of the flos coeli works. Some sheets are stretched out on poles in order to receive the heavenly dew. Below a man and a woman are wringing them to press out the divine liquor, that falls into a large vessel put there to that purpose. To the left one sees the Ram; on the right the Bull. The flos coeli have put the spirit of the bad puffers to torture. Some have seen in it a kind of magical influx, for to them magic is a supernatural power, acquired by concourse with spirits, good or bad. Others, more realistic and closer to the truth, have recognized in it the morning dew. The flos coeli is in fact called the water of the two equinoxes, from which one has deduced that it is obtained in the spring and in the fall, and is a mixture of these two fluids. Again others, believing themselves still better informed, would collect this mysterious product from a kind of algae or lichenoid whose vulgar name is nostoc. In the Seven Hints on the Philosophic Work, Eteilla, who was perhaps more worth than his reputation, seems to have obtained some satisfactory results with an analogous moss; but one must read his tract with some good glasses. 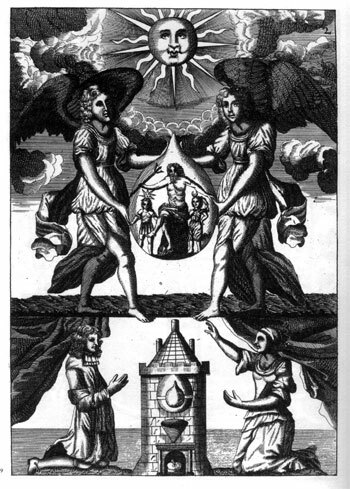 The Rosicrucians called themselves the “Brothers of the ripe Dew” according to the testimony of Thomas Corneille, a good hermetist as was his brother, the great tragic writer. Nevertheless, Philalethes scoffs disdainfully at the collectors of dew and rainwater, in which, notwithstanding, the Abbot of Vallemont recognized some virtue. It is up to the disciple to form his own opinion according to his own judgment. But it is beyond doubt that an agent kept secret, called “Celestial Manna” plays an important part in the work. We must declare, sincerely, that the Ram and the Bull in the plate, which one always takes for the signs of the zodiac under which one must collect the flos cæli, have no connection with the astrological symbols. The Ram is Hermes’ Criophore, which is the same as Jupiter Ammon; and the Bull, whose horns delineate the crescent, attribute of Diana and Isis, who are identical with the cow Io, lover of Jupiter, and the philosophers moon. These two animals personify the two natures of the Stone. Their union forms the Azyme of the Egyptians, the Asimah of the Bible, hybrid monster designating the orichalc, the latten or bronze oryx, the bull of Phalaris or of bronze, the golden or chrysocale calf4, which differs, most certainly, from the pinchbeck5 of Mannheim and is in some ways akin to German silver6. Briefly put, it is the electrum of the poets; but one should properly understand this word, which encloses the magical arcanum. Philalethes teaches that the gold of the hermetists is certainly not similar to vulgar gold. Furthermore, we add that, according to mythology, the Stone devoured by Saturn was called betulus, which is, really, the same word as vitulus, calf in Latin, and as vitellus, the yolk of an egg. The dough of unleavened bread was its hieroglyph. The priests from the bank of the Nile never touched the sacrificial breads with any steel or iron cutting tool: that would have amounted to a case of sacrilege. From this derives the ancient custom, still in use, of breaking the bread. Likewise in the catholic rite, the officiating priest divides the host by means of the silver-gilt paten. This whole logomachy7 conceals the vermilion of the Sages, or the philosophic amalgam of mercury, gold and the silver of art, rendered indissoluble by the flos cæli. One will learn, not without surprise, that bullfighting is a dramatic figuration of the Great Work. All games have a hermetic origin. The red cockade worn by the animal and to which is attached a prize bestowed upon the victor, is the image of the Rose of the philosophers. The grand concern is to be a good Matador. Also, according to Spanish tradition, “to accede to government, one must conquer the bull” - the mystic bull, evidently. This victory confers “chivalry”, true nobility, the one of Science, and consequently the scepter. This is why, under Louis XIII, the leaders of the “Kabbale d’Etat” were nicknamed “Matadors”. The species is not extinct, though obliterated and not apparent. The fifth plate initiates the disciple to the laboratory operations. One there witnesses a sequence of varied manipulations. One will see that it deals with the coction of the fluid collected in the preceding plate. A man and a woman appear to be pouring it into a pot put over the fire. In the figure below the man adds a viscous product and holds, in his other hand, a substance which is not difficult to discover, if one bears in mind that the egg of Hermogenes is analogous to the others. In the same picture, on the side, a naked person, decorated by a half-moon and embraced by an infant, receives a flask, where one notices four small triangles. They represent the proportions of elements put into the work, namely one part of sulfur to three of mercury. A lunar body intervenes in this operation, which has been indicated by an escutcheon carrying a silver moon on a field of gules. The Moon of the philosophers is not always silver, though this metal is convenient to the work at a certain point. In order to lead astray the profane, the Adepts gave this name to mercury and its salt, the preparation of which presents the most grave difficulties. In order that the mercury be suitable to the work, it is indispensable to animate it. This animation is performed by means of the sulfur prepared to this end. In Philalethes one will find the practical directions, which however must not always be followed word for word. He is exact, yet he fails to purge the mercury from its heterogeneous elements by separating the pure from the impure, the subtle from the gross. One sees, in this plate, the woman who gets ready to skim the compost. It is a presentation overburdened with work, but in the main exact. In the Work it is in fact the feminine element which performs the selection by means of its constitutive virtues; but the artist must lend a hand and assist nature with prudence. 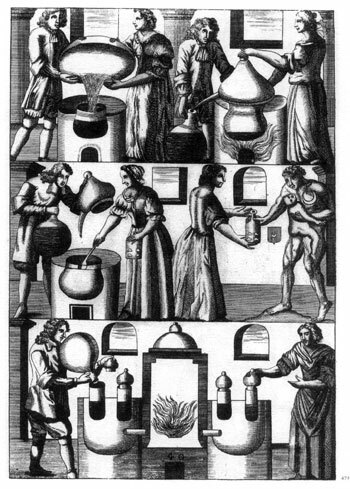 The other figures represent digestions and distillations. We will not be telling the sensible reader anything new, by saying that a man crammed up with chemical formulas and apt to resolve all school problems on a piece of paper, is not entitled to call himself a chemist. It is therefore necessary that theory is accompanied by practice, the one being the consequence of the other. Only laboratory practice gives mastership, for what is practice if not controlled by theory. The rigor of the former corrects the vagaries of the latter. Thus the disciple must exert himself to realize all his concepts. 1 sacred scribes, a lower rank of Egyptian priesthood. 3 Religious teacher and wonderworker of Crete, who according to the legend slept for 57 years ( ca. 500 BC ). 4 It is not irrelevant to recall here that Helvetius has written a treatise on alchemy under the title Vitulus Aureus (the Golden Calf). 5 Pinchbeck = copper + zink + tin. 6 German silver = copper, zinc & nickel.